Nikita Movies was developed with the purpose of making "movie lovers" a program that allows you to search and play movies online. The information structure is well elaborated, containing menus for specific search or by typing a "keywords" in the Search bar. 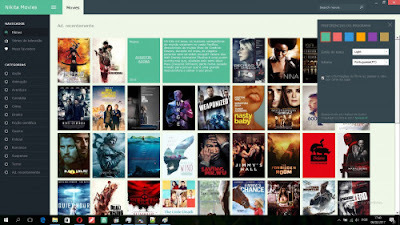 Users will be able to search for movies through categories in the Categories menu or by a certain keyword by typing it into the text box at the top of the window. After a search, the user can view the details of a particular movie and can play it. The program plays movies through a streaming connection, in which files are played with Nikita Movies, the files in question are not Stored on our servers, but only provides the links of the servers where they were hosted by third parties. The program presents a pleasant look and offers the user two different languages: Portuguese and English. At the moment the program is still in the test phase and therefore still has few films available.